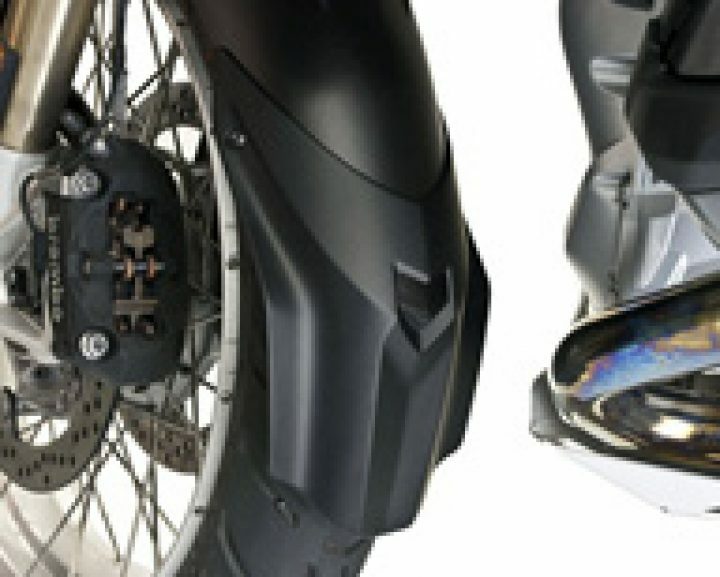 The AVANT_LC front fender extension for 2013~2018 R1200GS/ADV and the 2019 R1250GS/A is designed for "no drill" installation to protect the painted front engine surface and the exhaust headers vulnerable to premature chipping from road debris and coating with tar and mud. AVANT helps control this environmental assault, increasing longevity and reducing clean-up. The Avant installs in three minutes with two self-locking screw clamps that grip the underside of the fender, as well as engaging the tip of the fender for a secure fit. AVANT_LC can be easily removed for transfer to another bike in the future without leaving disfiguring holes behind. Injection molded in tough polypropylene, AVANT fits perfectly and its texture matches the stock BMW fender. It is shown in the photos with BMW's optional Enduro Skid Plate fitted to the standard GS. AVANT_LC fits the 2014+ GS/A with BMW's standard skid plate, but does not fit the GS/A comfortably with the optional Enduro Skid Plate - part #77148533747. 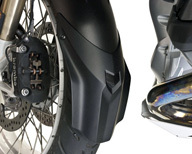 To enable longer suspension travel on the ADV, front end caster angle was changed reducing clearance between the AVANT_LC and the Enduro plate. Two aftermarket skid plates verified to fit with the AVANT on the GS/A are from Wunderlich, shown in one of the photos here, and the Touratech Expedition plate. The following skid plate DOES NOT FIT with the AVANT_LC: Black Dog. Alt Rider and SW Motech skid plates fit the standard GS, but not the GSA. We are testing other skid plates over time and will post them in our BLOGROLL.